Oat is an annual grass; a fibrous root produces a hollow, jointed stem from 2-4 feet high with more or less rough, pale green, narrow, flat leaves. The flowers are arranged in a loose terminal panicle from 6-12 inches long which usually consists of 2-4 flowered spikelets from 3/4 to 1 inch long. The hairy, grooved grain is narrow, with almost parallel sides. 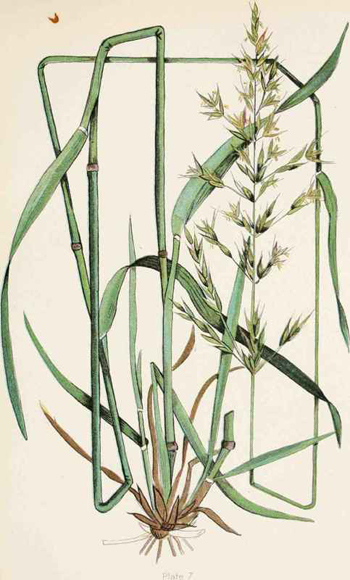 Other varieties: The Chinese oats (A. fatua) is called Yen-mai. Seldom cultivated in China; the wild variety is sometimes harvested in times of dearth and is used in making bread. Wild oats (Uvularia sessilifolia L.) is a perennial plant 6-12 inches tall. Leaves are sessile, not surrounding the stems; glaucous beneath. The stem is forked about 2/3 of the way up from the ground. Flowers are pale, straw-colored bells, blooming in May to June. 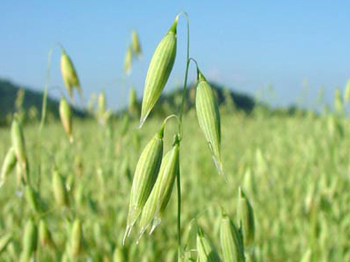 Wild oats are of the lily family and the roots are used medicinally. Native Americans used the root tea to treat diarrhea, and as a blood purifier. Internally, taken to aid in healing broken bones. Externally, poulticed for boils and broken bones. The root was a folk medicine for sore throats and mouth sores; said to be mucilaginous (slimy) and somewhat acrid-tasting when fresh. Widely cultivated for its edible grain. Long before breakfast meant a bowl of sugar-coated artificially flavored cereal, out ancestors thrived on whole grains such as oatmeal. The grain from the oat plant is nutritious, but more is known today about its effective way of reducing serum cholesterol. Rich in a gum called beta glucam, a water soluble form of fiber, 2 to 3 oz. of oat fiber per day along with a low-fat diet can reduce blood cholesterol by 5% to 10%. Oat extract is a natural relaxant and is excellent for indigestion. The dried coarse stem or straw can be used in baths to soothe hemorrhoids and to revitalize sore, aching feet. 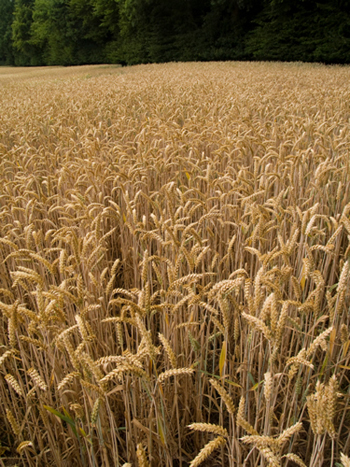 Oats are used in the making and flavoring of beer. Oatmeal facial mask: paste of dry regular oatmeal and a little warm water. 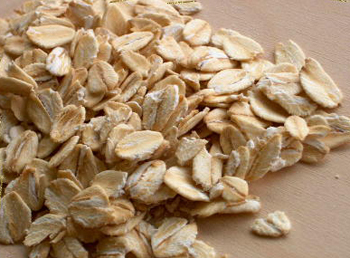 Dry oatmeal rubbed directly on skin will remove flaky, peeling skin. Everyone should eat foods rich in oat fiber. Gradually increase the amount of oat fiber ingested every day; give the body time to adjust to the change in diet. Too much at once may cause cramps and gas. Used primarily for nutritional value; of particular benefit in special diets for convalescents. Used in diets for patients with gastroenteritis and dyspepsia. Oat extract and tincture are useful as nerve and uterine tonics, including tonic effect on the nerve structure of the sexual organs, being effective in conditions of impotence or sexual debility due to over-indulgence. May also be used for prostate irritation. A tea made from oat straw once was recommended for chest problems. In Europe, oat straw is used for various baths, taken regularly, are helpful for a number of ailments. These baths, full bath, sitz bath, footbath, local wash, are good for rheumatic problems, lumbago, paralysis, liver ailments, gout, and gravel problems, gas, bladder problems, colic, depression, bedwetting, tired or chronically cold feet, skin diseases, flaky skin, frostbite, chilblains, wounds, canker sores, fever blisters, eczema, shingles, and eye problems. Culpeper claims that a poultice will help the itch and leprosy; also, a paste of oats boiled with vinegar takes away freckles and spots on the skin. Research, recently, has shown that oatbran, and to a lesser extent oatmeal, can help to reduce abnormally high blood cholesterol levels. Decoction: boil small pieces of oat straw in water for 1 hour. Strain and add a little honey. Tincture: take 10 to 20 drops, 3 times per day. Fluid extract: a dose is 10 to 30 drops, taken in hot water, take up to 3 times per day to relieve symptoms. When taking a dose before going to bed, take in cold water to avoid the risk of sleeplessness. Bath: boil 1 to 2 lb. straw in 3 qt. water for 30 minutes. Add to the bath water. Early signs of prostrate trouble, a tea should be taken in combination with black willow bark (Salix nigra) and celery seeds. 1 oz. each of oats, black willow bark are added to 2 1/2 pints of water. Bring to a boil and simmer slowly for 15 minutes. Strain and pour over 1 oz. of celery seeds. Cover the container and let stand until cold. Strain and take 1 cup 3 to 4 times per day. For those sensitive to gluten (as in celiac disease), allow the decoction or tincture to settle, then decant only the clear liquid for use.